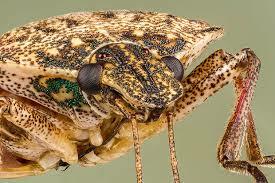 The brown marmorated stink bug is a kind of true bug identified within the Pentatomidae insect family. This bug affects a wide range of plants, including apple trees, and is also known by the scientific name Halyomorpha halys. Crops affected by the bug are usually unfit for consumption due to severe distortion of fruits and damage to the plant tissue. suitable environment to spend the winter. These insects can be seen both inside buildings, as well as beneath leaf litter or other forms of organic debris. This type of stink bug is present across many regions of the world, in particular Asia, where it prevails as a serious agricultural pest. In the United States, populations of the marmorated stink bug have been identified in numerous states such as New York, Pennsylvania, North Carolina, Tennessee, and California. Like other true bugs, the brown marmorated bug features a piercing/ sucking mouth-part that it uses to gain nutrients from the plants it infests. These bugs usually possess a distinct and unique array of patterns on their wing covers that are gray or brown in color. Adult bugs are generally about 2/3 inch in length and almost as wide as they are long. They also feature scent glands on their abdomen and thorax which they use to release a strong odor when attacked by other insects or any other potential threat presents itself. Nymphs, the immature stage of brown marmorated bugs, are similar to their adult counterparts though smaller in size. They possess the same distinct pattern on their backs and measure just about a few millimeters or as much as half an inch in length. These nymphs go through about five nymphal stages called molts before maturing into adults. 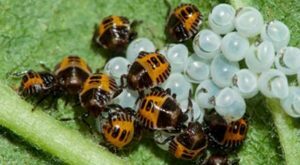 Eggs can easily be identified as, like many true bug eggs, they are only about a millimeter or two in length, elliptical in shape, and found in clusters of about 20 on the underside of leaves. They are usually yellowish in color. bug has a “marmorated” appearance, meaning its wing covers appear veined like marble. This beautiful pattern sets it apart from other true bugs. 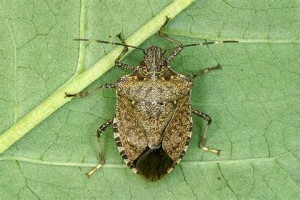 In addition, the bug’s scent glands are another special feature common in all stink bugs. This can trigger allergic reactions that include rhinitis – an inflammation of mucous membranes in the nose — in certain individuals who may experience sensitivity to the bug’s scent. Of note as well, is the brown marmorated bug’s ability to cause other issues such as dermatitis when its crushed body parts come into contact with an individual’s skin. Caulk opening near windows, doors and other areas of your home to prevent bugs from entering. Install door and windows screens where none are present or replace screens that show signs of damage. Keep gardens and surroundings free of excess leaf litter and other forms of debris as these may attract brown marmorated stink bugs and other pests. In cases where you identify brown marmorated stink bugs in your home or premises, remove them by using a vacuum. This, however, should only be done if you are not allergic to the bug’s scent as the vacuum will begin to absorb the stink bug’s odor. Pesticides which may help homeowners get rid of these stink bugs are available both in gardening stores and online. However, note that these chemicals should only be applied with careful consideration of the instructions included on the product’s label. Also, consider help from a pest control professional as these experts are usually equipped with knowledge required to verify the identification of the pest infesting your home. Once the pest is properly identified, they will be able to recommend and use only pesticides most effective in eliminating the brown marmorated stink bug.